Tree stumps are not meant for decorative landscapes and are an annoyance to mow around, not to mention a hazard and an accident waiting to happen for young kids. 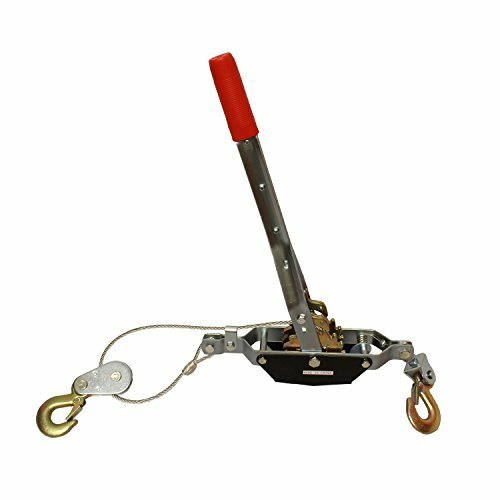 Pull, stretch, and move any heavy load with the ABN Heavy-Duty Hand Puller with Cable Rope - 2 Ton Capacity, Dual (2) Gear, 2 Hooks - Come Along Cable Puller Tool. This multipurpose work tool has a 2-Ton (1.8MT) maximum rated capacity and 1-Ton (0.9MT) safe working load limit (WLL) so you can easily move heavy equipment, tighten fencing, landscaping such as removing tree stumps or debris, and assist in loading a boat onto a trailer. This hand puller includes a nonslip cushioned rubber grip handle that offers safe and comfortable operation. It is ideal for any machine shop, boating, camping, landscaping, and farming. WARNING: This product can expose you to chemicals which is [are] known to the State of California to cause cancer and birth defects or other reproductive harm. For more information go to www.P65Warnings.ca.gov. 2 HOOKS FOR VARIOUS APPLICATIONS: 3/8-inch (9.5mm) hooks with 7.25-foot (2.2m) pull length can be used to move heavy equipment, tighten fencing, landscaping such as removing tree stumps or debris and assist in loading a boat onto a trailer.